Designers Paula Napper, Sara Warren and Donna King were investigating the use of reclaimed oak to create a pergola with a rustic tin roof. The pergola was part of their design for a garden installation at the 2016 Hampton Court Flower Show. During their research they came across our website and approached us to help them create the perfect look. 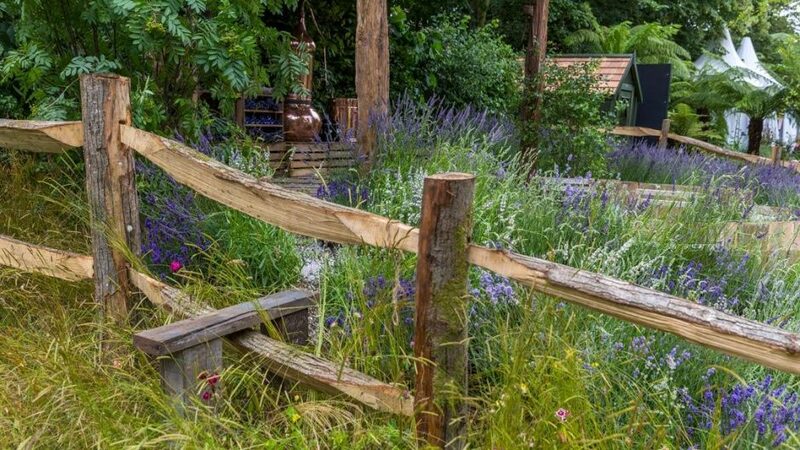 The inspiration behind the garden was the lavender grown on a Dairy Farm on the rolling hills of the South Downs. The garden was designed to depict rows of lavender in a field. 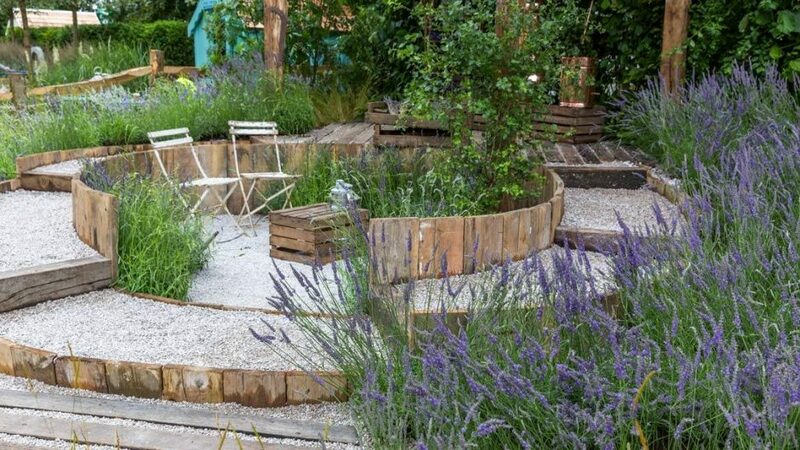 The designers envisioned a circular walkway enclosing a sunken seating area, leading to a rustic pergola using reclaimed oak. After an initial discussion with the designers they sent us diagrams of their design. We worked from these to create the finished product. We carefully selected reclaimed oak that would already fit the designs without being worked extensively. 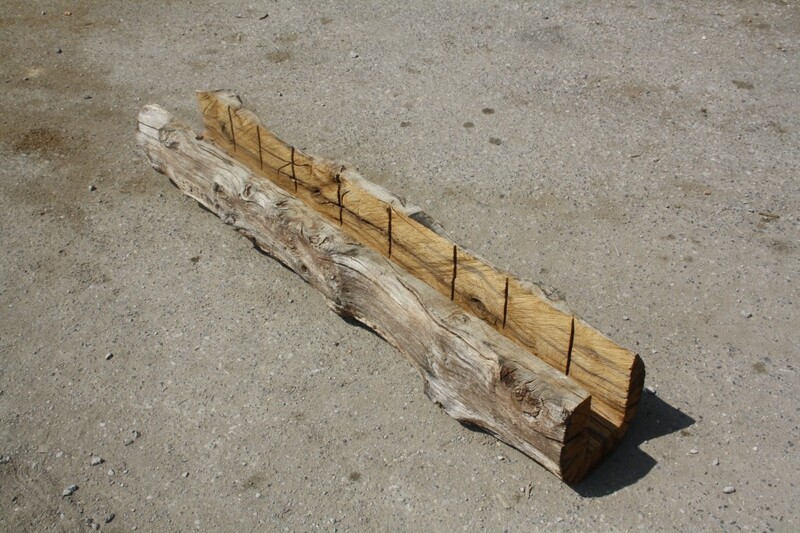 This meant we could keep the patina and ageing of the reclaimed oak, which could be up to 100 years old, to give the effect of the garden being well established. 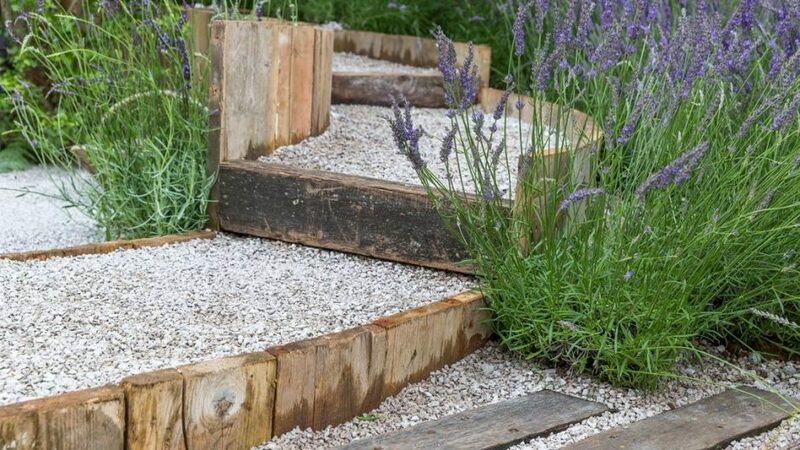 The edging for the curved walkway and sunken seating area was made from old oak floor boards. The boards were only sunk 4.5″ into the ground for stability. The boards were cut to size and roughened on site to give the impression of the board being sunk into the ground the entire length. The pieces were deburred on site to remove any splinters or possible hazards whilst retaining the desired weathered finish. To create the pergola and fences we used a combination of types of reclaimed oak which we split with traditional hand methods. Again, all the oak used was specially selected to fit the design so that it could remain unfinished. Although not our speciality we were also very pleased to help the designers locate some weathered corrugated iron for the roof of the pergola. It had been stored standing and had vertical rust streaks that made a perfect design feature! The finished design was supplied in a kit form and installed on site by Burnham Landscaping and The Landscaping Consultants. The semi-circular sections for the walkway and steps were first installed while the flowers were going in, then finally the pergola was built. 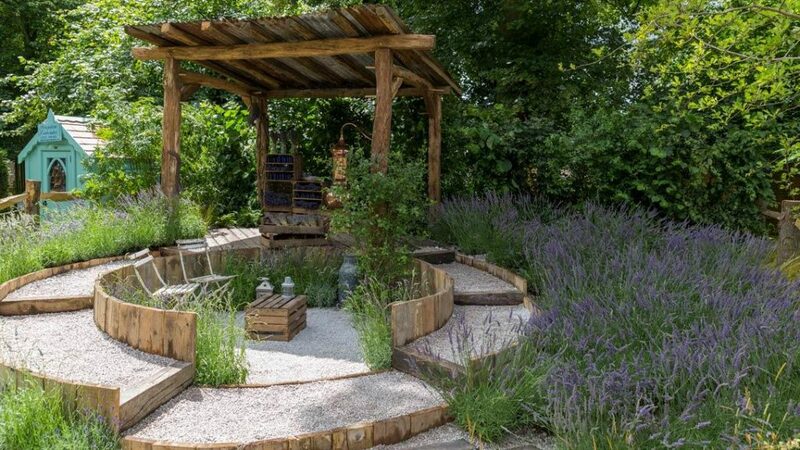 The finished garden, called The Lavender Garden, was a Gold Medal Winner at the 2016 Hampton Court Flower Show in the Summer Gardens category. We were delighted to be involved with the design of this garden and are always happy to work with designers at other flower shows. 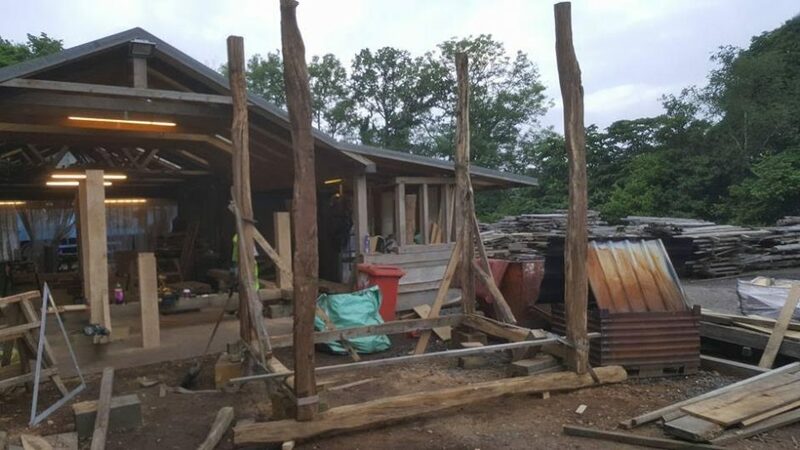 Do get in touch if you’ve ever considered using oak beams in your garden designs and we can use our years of expertise to help you realise your vision.